At the 2009 South Australian Friends of Parks Forum held recently FOMS was presented with one of three prestigious awards from the Department for Environment and Heritage. The award presented to FOMS, for outstanding achievement by a Friends group, was in recognition of the on-ground conservation and interpretation work that FOMS has been carrying out at the Peake Overland Telegraph Repeater Station near Oodnadatta in the Far North of the State. When FOMS first visited the site in 2007 it was concerned about the impact of an ever-increasing number of visitors on what is a nationally significant heritage site, the Peake being listed on both the South Australian and Australian heritage registers. In 2008 FOMS commenced on-ground conservation works aimed at more effectively managing visitor impacts at the site, whilst at the same time explaining more effectively to visitors why the site is nationally significant. The work continued this year and the erection of two kilometres of fencing in the next few weeks will mark completion of the physical protection works. Subject to funding, self-guided walking tracks will be marked next year and interpretative information provided to identify and explain features of interest along the walks. The most productive aspect of the project has been the partnership model. Without engaging partners from within and outside of government it would have been impossible for the Friends to undertake the work. At the same time, without the Friends undertaking its role of consulting with key parties, encouraging involvement and developing a programme of works acceptable to all interests, the work would not have been undertaken and the nationally significant heritage values of the site would have been further compromised. 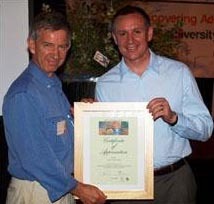 The award was presented to FOMS President Colin Harris by the Hon Jay Weatherill, South Australian Minister of Environment and Conservation, at the Forum Dinner on 31 October 2009. It is intended that $1250 accompanying the award will be used for further work at the Peake and also at Strangways Springs Overland Telegraph Repeater Station. It is pleasing that FOMS has gained this recognition only a few years after its formation and we look forward to developing further work programmes that contribute to the better management of the mound springs of our Far North. The two other recipients of DEH awards were Friends of Scott Creek Conservation Park and Friends of Parks KI, Western Districts.